Are you planning to launch fresh and friendly looking websites for kindergartens, child care, babysitting, nursery or pre-schools? With WordPress and a suitable children and kid’s WordPress theme you have the right tools at hand which help you to create nice and professional online presences with ease. Children and kids WordPress themes offer all kinds of features which you may need for your site, like for example cute site decorating elements, appealing and friendly colors, simple yet efficient layout options and many more to present your website content. When creating websites for child care, nursery, babysitting, pre-school or else, some features will help you a great deal if they are included in your children WordPress theme already. That is for example a slider to present your services or latest news, photo gallery to display snapshots from kid’s events and color options to adapt your website to match your corporate design. Besides, your kids WordPress theme should come with a fully responsive layout to show your content well organized on mobile devices as well. And displaying an events calendar can give a helpful overview of upcoming events at your pre-school, school or kindergarten. There are a couple of suitable WordPress themes for children or kids related websites available which can be used to create informative, friendly and appropriate websites. In our children and kids WordPress themes collection you can find some of the best and most popular WordPress templates for this purpose. The listed children WordPress themes are perfectly suitable to create simple websites, but they are also ideal for advanced and more complex sites for kindergartens, child care, nursery, babysitting, school, pre-school institutions. All these WordPress themes require a self-hosted WordPress site. You will need your own domain and reliable web hosting. PILE is a creative portfolio WordPress theme which is perfect to showcase creative work of any kind. This flexible and refined portfolio WordPress theme is suitable for designers, photographers, illustrators, art directors, creative freelancers or else. PILE offers smooth parallax scrolling and unique transitions to show your projects in a very attractive and modern way…. 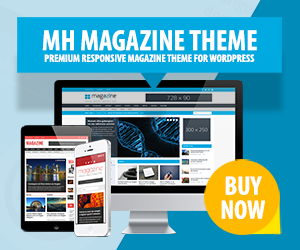 This is an additional demo of MH Magazine WordPress Theme which shows how you could use this versatile magazine theme to create vibrant and dynamic news portals or online newspapers. Thanks to the fully widgetized front page you can present lots of content to your readers in an organized and appealing manner.